Tuesday night brought a close to the Big 8 dual season as the Madison Memorial Spartans traveled to Monterey Stadium to take on Janesville Craig. Although both the boys & girls teams lost their individual dual meets many positives were taken out of this meet as we close in on the stretch run of the season. Next week begins championship season as both the boys & girls teams will look to defend their Indoor City Championship titles by competing at Lussier Stadium for the Outdoor City Championship. As each athlete winds down their season it is important that we take a little more time to get some sleep, eat healthy, stay ahead in school work, & be ready to end the season with a personal best effort. 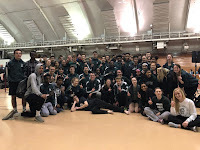 Event winners on Tuesday night included: Daurice F in 110m hurdles (14.8) & 300m hurldes (40.5), Ryan B in shot put (40' 10") & discus (126' 8"), & Micah P in triple jump (42' 11") on the boys side. Phibi M in 100m hurdles (16.8), Siena C in the 1600m run (5:33.4), Caroline B in the 400m dash (1:04.5), Meghan S in the 800m run (2:33.7), and Sydney S in the high jump (5' 0") on the girls side. Some notable performances from the night include: Caleb H improving 4 secs in the 400m dash, Joe P PRing by 1.5 secs in the 200m dash, Jack Z taking nearly 40 secs off his 3200m time, Connor L with a 2 foot improvement in shot put, Alec D with nearly a 10 foot improvement in discus, Drake S PR ing in the long jump by 5.5 inches, & Dondreon C clearing a new personal best in the pole vault by 6 inches. For the girls Kayla G improved her Spartan Seven pole vault performance by 3 inches, Rachel R threw 10 feet further and Mary S 9 feet further in the discus, Caroline B, Meghan S, Amelia F, & Allison H all dropped time off their 400m dash PRs, Gretchen H took 10 secs off her 1600m run time, & Julana DW improved her 100m dash season best. It is important time of year to communicate with your coaches about what meet will be your last meet and be prepared to end your season on a high note. Some athletes will be finishing next week at city, most athletes will be done after conference, and a select few hope to extend their season in to June with a trip to the WIAA state meet. Come ready to compete, cheer on your teammates at meets you are not competing in, and finish the season proud as a Madison Memorial Spartan.